Campsite le Moulin pitch only campsite is located in Patornay in the Jura region of France. Campsite le Moulin is set within 5 hectares of stunning grounds, next to the river Ain. Surrounded by woodland, the campsite is an ideal place for those that love nature. The grounds are well landscaped with a plethora of flora and fauna and the local woods provide the perfect place for people looking for a great place to walk, hike and bike. The campsite is a stones throw from the local Lac de Vouglans which is ideal for those who love the water. Not only does the lake offer a number of fantastic beaches but there are also a whole variety of different water sports on offer. These include fishing, diving, water skiing, jet skiing, motor boating, sailing, windsurfing, canoeing, kayaking and much more. Although the lake is nearby, many visitors to Campsite le Moulin love to stay a little close and utilise the river. There really is nothing better than sitting by the river bank and watching the world go by. Fishing, swimming, canoeing and just messing around are just some of the activities many families take part in each year whilst visiting the campsite. One of the great things about Campsite le Moulin is its location. 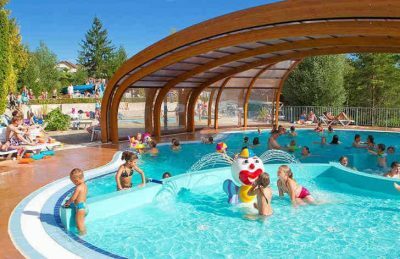 Fairly central within the Jura region, the campsite is the perfect place for a base from which you can explore the delights of the region. With so many places to visit nearby to the campsite you may wonder why so many people remain onsite. 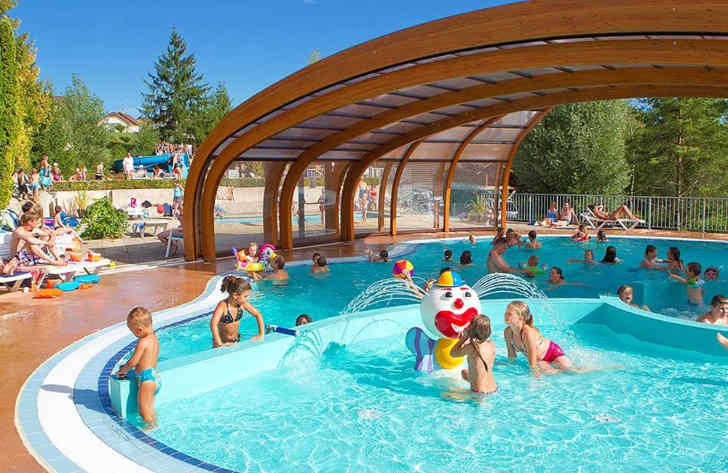 The swimming pool complex is one reason boasting an indoor heated, outdoor heated and toddlers pool and slides which are all great for families of all ages. On-site activities at Campsite le Moulin include a playground, multi sports field, boules, table tennis, cycle hire, fishing and kayaking. This pitch only campsite is perfect for campers with tents, caravans and / or motorhomes. Facilities include: WIFI, takeaway, pizzeria, bar, snack bar, grocery shop, animation team, tv room, games room, safe rental, washers, dryers, laundry sinks, washing up sinks, washbasins, individual washcabins, showers, standard toilets, baby room, children’s sanitary facilities and chemical toilet disposal points. The camping pitches at Campsite le Moulin are around 90m to 110m2 in size, separated by fencing and trees. Click the button below to book a camping pitch at Campsite le Moulin with our travel partner, Suncamp.